1. Attention: if for kids, suggestion wrist over 135cm at least.thank you. 2.Choose different color to change mood in daily life. 3.Wristband ergonomic, durable, moderate softness, very comfortable to wear. 4.Easy to clean with an brush and some dawn. 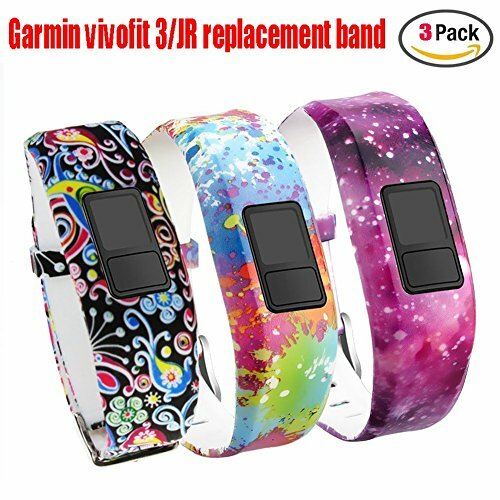 1.This replacement wristband Personalized for Garmin Vivofit 3 Vivifit JR and Vivofit JR. 2 wrist strap used 100% high quality material,comfortable for sporting time, nice replacement for lost or damaged bracelet. No Tracker include. Attention: if for kids, suggestion wrist over 135cm at least.thank you. 3.Precise multiple holes design, let you adjust to suitable length. Free Size suit for most peole(4.7"-8.2/135mm-215mm)you don't have to worry about improper size.Attention:this size as orginal. if used for Kids,please meature your kids wrist first.wrist suggestion over 135cm at leat. 4.we supplied optional color for optional which can make your Garmin Vivofit 3 Vivifit JR and Vivofit JR. 2 in a new look match your daily style with sharp, colorful and fashionable choice . If you have any questions about this product by Budesi, contact us by completing and submitting the form below. If you are looking for a specif part number, please include it with your message.